(7078, Oklahoma Historical Society Photograph Collection, OHS). (20778.AG.SCS.OKLA.8186 , Edd Roberts Collection, OHS). (21412.M525.6, Z. P. Meyers/Barney Hillerman Photographic Collection, OHS). Wheat is the most important crop raised on the Great Plains, and Oklahoma is one of the top wheat-producing states in that region. In the late 1870s German Mennonite immigrants from Russia introduced 'Turkey red' wheat to Kansas. This hard winter wheat was well suited to making flour for bread, and it spread throughout the southern plains states. Before the Land Run of April 22, 1889, the Five Tribes grew wheat in Indian Territory. Tribes such as the Cherokee brought wheat culture with them from the South. Harvesting was carried out by community cooperative harvesting crews. Wheat was also introduced into Oklahoma by Indian agents and by whites who had married into tribes. The largest wheat farm in the Oklahoma and Indian territories by 1900 was the Miller Brothers 101 Ranch. Covering five thousand acres, the ranch's wheat field was located on the Ponca Reservation in present Kay and Noble counties. During the Land Run of 1889 Oklahoma and the rest of the southern Great Plains were in the midst of a serious drought that lasted until 1896. The favored cash crop of those making the run was winter wheat, but in April it was too late to plant. Therefore, the settlers suffered hardship. Short of money, they borrowed seed wheat from the Atchison, Topeka and Santa Fe (AT&SF) and Chicago, Rock Island and Pacific railways at cost. The railroad companies required only that the farmers have two neighbors certify that the seed would be used solely for planting. AT&SF employee Frank J. Best recalled that farmers repaid about 95 percent of the debts. In 1896 the drought broke. As a settler in the Cherokee Outlet recalled, "The wheat crop was wonderful. . . . That was a God-send. . . ." Bumper wheat crops in the next five years led to greatly expanded conversion of grassland to wheat cultivation, temporarily overwhelming Oklahoma Territory's capacity to store and ship the grain. 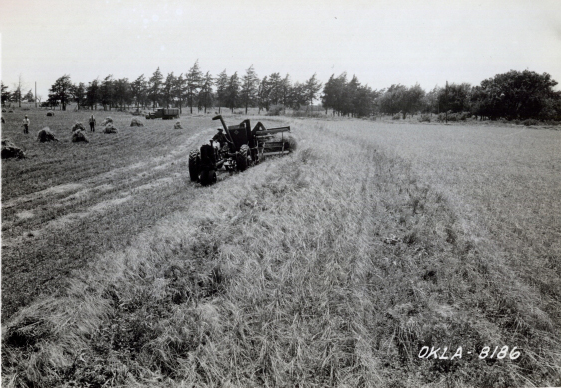 By the 1920s Oklahoma's wheat culture was most productive in the northern and western regions of the state. As wheat does not require as much moisture, the soil and climate were more conducive to growing it than crops such as corn or even sorghum. In 1921, 1926, 1928, and 1929 Texas County in the Panhandle was the nation's most productive county for winter wheat. The regional distribution of wheat cultivation in Oklahoma has persisted, with the north-central, southwest, west-central, and Panhandle regions leading in acreage, yields, and production. Clinging to the mystical belief that "rain follows the plow," by the 1930s Oklahoma farmers had overcultivated and overgrazed much of their land. When another cycle of prolonged drought began in the 1930s, the cultivation of wheat and other crops was crippled by massive soil erosion. Another severe drought hit Oklahoma in the 1950s. The devastating impact of erosion is indicated by the yield per acre of wheat, which plunged to a record low of only eight bushels in 1955. 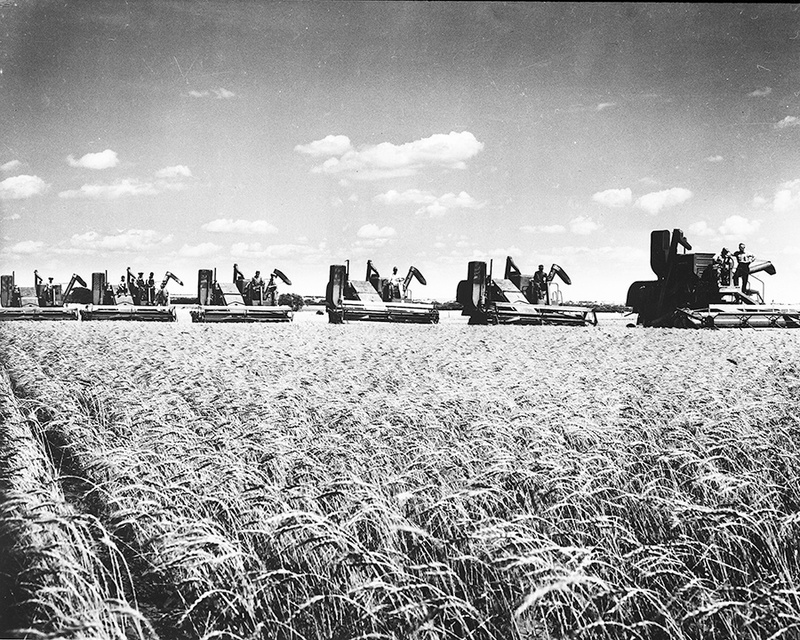 Production of wheat and other grains in the Panhandle increased in the 1960s with the use of sprinkler irrigation fed by deep-well pumps. In the twenty-first century, for example, the Panhandle region (Beaver, Cimarron, Ellis, Harper, and Texas counties) had 172,000 of the 200,000 irrigated wheat acres in Oklahoma. The future of irrigated wheat crops has been threatened, however, by serious and irreversible depletion of the Ogallala Aquifer. An Oklahoman who made a major contribution to wheat farming is Joseph Danne (1887–1959). A self-taught plant breeder, he developed several varieties of 'Triumph' wheat, the type that still dominated wheat farming in the southern plains at the beginning of the twenty-first century. Wheat remains the dominant cash crop in Oklahoma. In 2004 the state's farms produced almost 11 percent of the nation's winter wheat crop (second in the United States), and almost 8 percent of all wheat produced (fourth in the nation). Charles N. Gould, "Oklahoma—An Example of Arrested Development," Economic Geography 2 (July 1926). Donald E. Green, "Beginnings of Wheat Culture in Oklahoma," Rural Oklahoma, ed. Donald E. Green (Oklahoma City: Oklahoma Historical Society, 1977). John C. Hudson, "Agriculture," in Encyclopedia of the Great Plains, ed. David J. Wishart (Lincoln: University of Nebraska Press, 2004). Edmund A. Peters, "Joseph Danne: Oklahoma Plant Geneticist and His Triumph Wheat," The Chronicles of Oklahoma 59 (Spring 1981). Paul D. Travis and Jeffrey B. Robb, "Wheat," The Encyclopedia of Oklahoma History and Culture, https://www.okhistory.org/publications/enc/entry.php?entry=WH001.